Molecular Analysis | Hematologics, Inc.
TAT: 3-7 days Colony-stimulating factor 3 receptor gene (CSF3R) mutation analysis for chronic neutrophilic leukemia (CNL) and atypical chronic myeloid leukemia (aCML). BRAF TAT: 3-7 days BRAF V600E mutation detection in Hairy Cell Leukemia. * RNA-based assays = please provide minimum of 5 mL peripheral blood or 3 mL of bone marrow in lavender top tube [EDTA]. Overnight shipping and processing within 24 h required for accurate results. +DNA-based assays = Fresh or paraffin-embedded specimens. FFPE bone marrow biopsies can result in inadequate DNA due to decalcification treatment [clot sections preferable]. The gene encoding calreticulin (CALR) has recently been identified as a new cancer gene that is mutated in the majority (~70-85%) of essential thrombocythemia (ET) and primary myelofibrosis (PMF) cases with nonmutated JAK2 [Nangalia et al. ; Klampfl et al.]. CALR mutations have been found to be the second most frequent genetic mutation in MPN after Jak2 and insertion/ deletion mutations are primarily detected in Exon 9 [Nangalia et al. ; Klampfl et al.]. Mutations in CALR have been reported to be mutually exclusive with mutations in both JAK2 and MPL and are not reported in polycythemia vera (PV)[Nangalia et al. ; Klampfl et al. ; Rumi et al.]. The identification of CALR Exon 9 insertion/deletion mutations in myeloproliferative neoplasms (MPN) may be useful to assist diagnosis, classification and monitoring [Nangalia et al. ; Klampfl et al. ; Rumi et al.]. In addition, presence of CALR mutations is also associated with a more benign clinical course than the corresponding disorders associated with JAK2 or MPL mutations [Nangalia et al. ; Klampfl et al. ; Rumi et al. ; Rotunno et al.]. Polymerase chain reaction (PCR) amplification in combination with fluorescence-based capillary electrophoresis is utilized to detect and monitor insertion/deletion mutations CALR Exon9. For specimens confirmed positive by fragment length analysis (increased sensitivity, monitoring) additional testing is performed by bi- directional Sanger Sequencing for confirmation. 2 mL of peripheral blood or 1 mL of bone marrow (lavender top, EDTA or green top, Heparin). Nangalia J, Massie CE, Baxter EJ, et al. Somatic CALR mutations in myeloproliferative neoplasms with nonmutated JAK2 N Engl Med.2013;369(25):2391-405. Kampfl T, Gisslinger H, Harutyunyan AS, et al Somatic mutations of calreticulin in myeloproliferative neoplasms. N Engl J Med. 2013;369(25):2379-90. Rumi E, Pietra D, Ferretti V, et al. JAK2 or CALR mutation status defines subtypes of essential thrombocythemia with substantially different clinical course and outcomes. Blood.2013 Dec 23. Rotunno G, Mannarelli C. Guglielmelli, P, et al. Impact of calreticulin mutations on clinical and hematological phenotype and outcome in essential thrombocytopenia. Blood.2013 Dec 16. HematoLogics Inc. offers B-Cell (IGH & IGK) and T-Cell Receptor (TCRG) Gene rearrangement assays to detect monoclonal cell populations in peripheral blood, bone marrow, body fluids and tissues (fresh or paraffin-embedded). Unsurpassed 24 – 48 h turn-around time. Highly sensitive fluorescence based capillary electrophoresis fragment analysis allows monitoring of individual tumors. Optimized and standardized multiplex PCR protocols for clonal gene rearrangment detection by the BIOMED-2 Concerted Action [van Dongen et al. Leukemia, 17:2257-2317, 2003] with unprecedentedly high detection rate. Immunoglobulin Light Chain Kappa (IGK) available in addition to the Immunoglobulin Heavy Chain (IGH) gene rearrangement assay. IGK analysis can detect B-cell proliferations in which somatic hypermutations [germinal center and postgerminal center B-cell malignancies] may hamper amplification of the IGH loci. Only one specimen for High Resolution Flow Cytometry™ and Molecular Analysis. Integrated results for High Resolution Flow Cytometry™ and Molecular Analysis. Cell Sorting combined with Molecular Analysis can be used for Minimal Residual Disease detection and for confirmatory testing in difficult cases. Monoclonal Peaks detected with Immunoglobulin Heavy Chain conserved framework (FR) primers at 340 bp for FR1 and 273 bp for FR2. [blue=FR1; black=FR2; green=FR3; red=size standard] in lymph node specimen suspicious for lymphoma. HematoLogics Inc. offers a comprehensive test menu of quantitative PCR assays for detection and monitoring of chromosomal translocations. Quantitative real-time polymerase chain reaction (PCR) assays with primers for the BCL2 MBR-JH and the BCL2 mcr-JH rearrangement regions are used for specific amplification of the t(14;18) genomic translocations. In approximately 70 % of follicular lymphoma cases the t(14;18) translocation can be detected by PCR and consequently this assay can be used to monitor minimal residual disease. A quantitative real-time polymerase chain reaction (PCR) assay with primers for the BCL1 MTC-JH rearrangement region are used for specific amplification of the t(11;14) genomic translocation. In approximately 50 % of mantle cell lymphoma cases the t(11;14) translocation can be detected by PCR and consequently this assay can be used to monitor minimal residual disease. Quantitative molecular analyses of acute lymphoblastic leukemia can identify chromosomal translocations useful for sensitive disease monitoring and to provide independent prognostic information for treatment strategies. HematoLogics utilizes real-time quantitative polymerase chain reaction (RQ-PCR) assays to detect fusion transcripts which are associated with the presence of the t(9;22), t(1;19), t(4;11) and t(12;21) translocations. All translocation assays can be used individually. Utilizes real-time quantitative polymerase chain reaction (RQ-PCR) to detect BCR/ABL fusion transcripts which are associated with the presence of t(9;22) Philadelphia (Ph) translocation resulting in a small derivative chromosome 22 known as Ph associated with CML, ALL and/or AML. Report includes spreadsheet and monitoring chart, ‘International Scale % Residual Disease’ [White HE et al Blood. 2010 Aug 18], % Reduction, Log Reduction and normalized copy numbers according to the ‘Europe Against Cancer Program’ [Gabert J et al. Leukemia 2003 (17): 2318-2357]. Reporting of standardized Bcr/Abl values [Gabert J et al. Leukemia 2003 (17): 2318-2357] in concordance with current IS [White HE et al Blood. 2010 Aug 18] since 2006. Side-by-side testing to patient-specific baseline, not laboratory means. Specimen archiving for future ABL kinase domain mutation analysis (Gleevec/TKI resistance). One specimen required for Flow Cytometry, Cytogenetics and Molecular Analysis. Detection of the m-bcr (minor breakpoint cluster region) e1-a2 transcript encoding the 190 kDA (p190) protein and the M-bcr (major breakpoint cluster region) b2a2 (e13a2) and b3a2 (e14a2) transcripts encoding the 210 kDA (p210) chimeric tyrosine kinase protein with a sensitivity level of approximately > 1 in 10e5 transcripts (0.001 %). Qualitative single fusion transcript analysis for m-bcr and M-bcr available as reflex option available upon request. HematoLogics offers quantitative molecular analyses of acute myeloid leukemia to identify chromosomal translocations useful for sensitive disease monitoring and to provide independent prognostic information for treatment strategies. Our laboratory utilizes real-time quantitative polymerase chain reaction (RQ-PCR) assays to detect fusion transcripts which are associated with the presence of the t(15;17) + t(8;21) + inv(16) translocations. All translocation assays can be used individually. Utilizes real-time quantitative polymerase chain reaction (RQ-PCR) to detect PML/RARA fusion transcripts which are the molecular result of the t(15;17) translocation associated with the majority of APL cases, a distinct AML subset with M3 cytomorphology. This test can detect all three possible PML-RARA isoforms, referred to as long (L, or bcr1), variant (V, or bcr2) and short (S, or bcr3) with a sensitivity of at least 1 in 10e4 transcripts (0.01 %). Quantitative assay units are reported according to the ‘Europe Against Cancer Program’ (EAC) standardized protocol [Gabert J et al. Leukemia 2003 (17): 2318-2357] and can be used for treatment monitoring. Quantitative detection of Wilm’s tumor (WT1) gene transcripts for monitoring purposes in MDS and AML. Detection of the cryptic t(5;11) for prognosis and quantitative monitoring of AML. Translocations involving nucleoporin 98kD (NUP98) on chromosome 11p15 occur at relatively low frequency in acute myeloid leukemia (AML) but can be missed with routine karyotyping. Recently, a specific fusion of NUP98 with nuclear receptor-binding SET domain protein 1 (NSD1) has been analyzed in ~1000 pediatric and adult AML cases. NUP98/NSD1 translocation is a frequent cryptic event within pediatric CN-AML (16.1%) compared with adult CN-AML (2.3%) (Holink et al., 2011). A possible functional link between FLT-3-ITD and NUP98/NSD1 fusion was suggested in the AML cohort (Thol et al., 2012). NUP98/NSD1 gene fusion and its related gene expression signature are strongly associated with a poor prognosis in pediatric acute myeloid leukemia (Shiba et al., 2013). Hollink et al.(2011). NUP98/NSD1 characterizes a novel poor prognostic group in acute myeloid leukemia with a distinct HOX gene expression pattern. Blood 118, 3645-3656. Shiba et al.(2013). NUP98 – NSD1 gene fusion and its related gene expression signature are strongly associated with a poor prognosis in pediatric acute myeloid leukemia: NUP98 – NSD1Gene Expression Signature in AML. Genes, Chromosomes and Cancer. Thol et al. (2012). Analysis of NUP98/NSD1 translocations in adult AML and MDS patients. Leukemia 27, 750-754. Utilizes real-time quantitative polymerase chain reaction (RQ-PCR) to detect FIP1L1-PDGFRA fusion transcript, which is associated with the presence of an interstitial deletion on chromosome 4q12. The identification of the FIP1L1-PDGFRA fusion transcript may assist diagnosis, classification and monitoring of hypereosinophilic syndrome (HES) and chronic eosinophilic leukemia (CEL). The hallmark genomic abnormality of chronic myelogenous leukemia (CML) is caused by a translocation between the long arms of chromosomes 9 and 22 (Philadelphia Chromosome), resulting in a hybrid gene, BCR/ABL. Gleevec® (imatinib), a tyrosine kinase inhibitor, is the current first choice therapy for patients suffering from CML. However, a sub-set of patients who initially respond to Gleevec relapse after a period of time. The emergence of resistant leukemia clones bearing mutations in the BCR-ABL kinase domain (KD) represents a major mechanism of disease recurrence that can be treated by changing therapy. As alternative therapies are available for imatinib resistance, early identification of mutations may prevent disease progression. ABL kinase domain sequence analysis has been previously recommended for patients with significant BCR-ABL RNA increase (> 3-fold) in order to identify imatinib mesylate (Gleevec) resistance mutations [Press et al. Blood 2009 p.2598-2605]. To date, more than 50 different KD mutations, conferring variable degrees of imatinib resistance, have been described and can be detected by this analysis. This assay analyzes the patient-specific BCR/ABL fusion transcript sequence for the presence of resistance mutations. Polymerase chain reaction (PCR) of the BCR/ABL kinase domain followed by DNA sequencing using overlapping primer sets is used and mutations are identified by comparison analysis to the un-mutated kinase domain sequence. 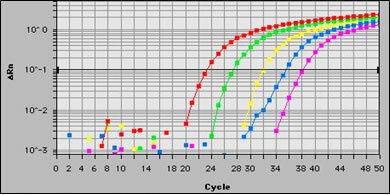 A mutation must be present in approximately 20% of the cell population to be detected by this assay. 2 mL of peripheral blood or 1 mL of bone marrow (lavender top, EDTA) for molecular analysis only. The V617F mutation of the JAK2 (Janus kinase 2) gene has been described in 74 – 97 % of polycythemia vera (PV), in 33 – 57 % of essential thrombocythemia (ET) and in 35 – 50 % of idiopathic myelofibrosis (IMF) cases [Baxter et al. The Lancet 2005: 1054 – 1061] [Levine et al. Cancer Cell 2005: 387-397]. The identification of the V617F JAK2 point mutation in myeloproliferative disorders (MPD) is useful to assist diagnosis, classification and monitoring. The D816V c-Kit point mutation has been associated as a prognostic indicator with shorter event-free survival in core binding factor (CBF) acute myeloid leukemia (AML) [Boissel N et al. Leukemia 2006]. In mastocytosis the c-Kit mutation has been associated with both aggressive systemic disease and increased bone marrow mast cell content [Pardanani et al. Leukemia Research 27 2003: 739-742]. In addition, it has been shown that the D816V c-kit activation loop mutation is highly resistant to Imatinib (Gleevec). Therefore identification of this mutation might be informative for therapeutic decisions in systemic mast cell disease (SMCD) and acute myeloid leukemia (AML) [Krystal GW, Leuk Res 2004: S53-S59; Growney JD et al. Blood 2005 106(2): 721-4]. MYD88 L265P mutation is a widely prevalent somatic mutation in patient with Waldenstrom’s macroglobulinemia (WM)/ lymphoplasmacytic lymphoma (LPL). Jak2 exon 12 mutations have been associated with PV and the absence of the Jak2 V617F mutation. Rare in ET or PMF. W515L/K mutations of the juxtamembrane region of the thrombopoietin receptor MPL (myeloproliferative leukemia virus oncogene homology) have been described in JAK2 V617F-negative primary myelofibrosis(PMF) and essential thrombocythemia (ET). CEBPA mutations have been reported in 4% to 11% of adult AML patients and are associated with improved outcome. CEBPA mutations are more prevalent in patients with normal-intermediate risk karyotype. AML patients with NPM1 mutations and normal karyotype have been shown to demonstrate better response to induction therapy and more favorable long-term survival if not associated with FLT3-ITD mutations. NPM1 mutations are more prevalent in patients with normal karyotype and are also associated with no or low CD34 expression and FLT3-ITD mutations. The determination of the mutational status of rearranged immunoglobulin heavy chain variable (IGHV) genes in patients with chronic lymphocytic leukemia (CLL) has shown strong and independent prognostic value. The lack of hypermutations in the IGHV gene detected by sequence analysis is predictive of a poor prognosis. HematoLogics will archive DNA for future Molecular Analysis purposes for all diagnostic B- and T- cell tumor specimens sent for Flow Cytometry analysis at no extra cost. Tumor clonality fingerprints can be identified by gene rearrangement analysis from diagnostic DNA specimens. Clonality fingerprints can be used for patient specific analysis of follow-up specimens during treatment monitoring or in the case of a suspected relapse. In addition, patient specific tumor clonality fingerprints allow monitoring at sensitivity levels below 0.01 % by combining flow cytometry cell sorting and gene rearrangement analysis.